Superior quality is the hallmark of steel structures from Steele Solutions, where the integrity of our products is built upon the integrity of our people. 1) Consultation — We respond in a timely manner, listen carefully, ask all the right questions and then present the best, most economical solution that meets your specific needs. 2) Design – Our engineers are experts in the design of steel structures, and have solved numerous design challenges on projects from basic to extremely complex. We have Professional Engineers on staff, and PE-stamp our drawings for all 50 states and Canada. We design in accordance with AISC and CISC standards. We design for all seismic zones. We are innovative, offering industry-leading solutions such as our groundbreaking moment connection. We utilize state-of-the-art engineering technology. We assure seamless equipment integration. Our designs consider your environment, so the structures won’t interfere with other operations. 3) Manufacturing – We implement advanced manufacturing technology to ensure quality and efficiency. 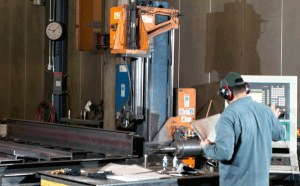 We employ welders who are AWS- and CWB-certified and engage robotic welding. Our manufacturing plants include CNC drill presses to assure proper bolt-hole placement. Our nut-and-bolt construction uses ASTM A325 heavy hex bolts. Upon completion of the fabrication, all parts are clearly marked for easy installation, and wrapped for protection during transportation to your location. When paint is desired, we offer a powder paint line that provides a highly durable finish. Galvanizing is also available for structures that need to withstand harsh environments. Based on our engineering expertise and our advanced manufacturing processes, we are licensed as a City of Los Angeles fabricator –one of the toughest standards in the nation.